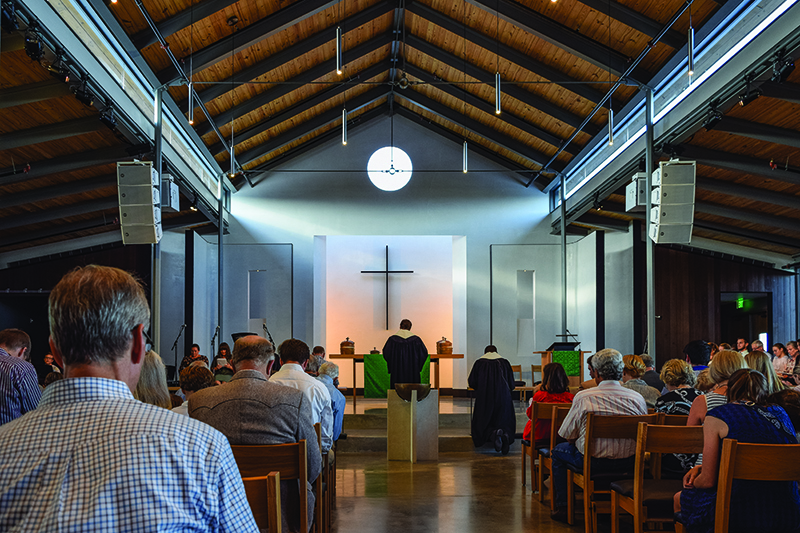 Reverend Tim Frickenschmidt and the congregation of All Saints Presbyterian Church, Austin, dedicate the altar in their interim sanctuary, designed by Andersson-Wise Architects. Photo by Jason John Paul Haskins, Assoc. AIA. 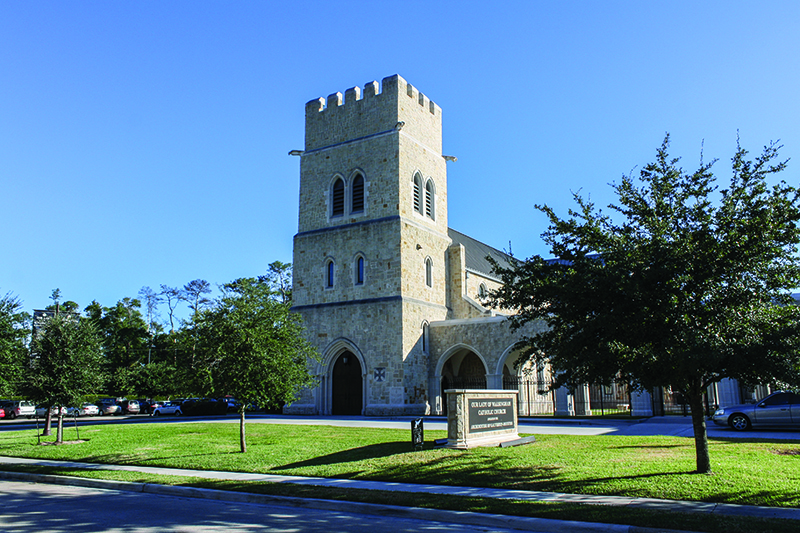 The strong Anglo-Saxon tower of the Our Lady of Walsingham, Houston, designed by HDB/Cram and Ferguson, embodies the Anglican heritage of the Personal Ordinariate’s liturgy. Photo by Jason John Paul Haskins, Assoc. AIA. Two projects by Duncan Stroik: a new chapel for the Carmelite Hermitage in Christoval, Texas, is an eloquent rendition of a Renaissance interior; the master plan for the expansion of a Roman Catholic seminary in Houston is based on Neoclassical principles. Image by Duncan Stroik. The tectonic elegance of Gothic architecture is lost in translation in the tilt-up concrete of Our Lady of the Atonement, San Antonio. Photo by Jason John Paul Haskins. 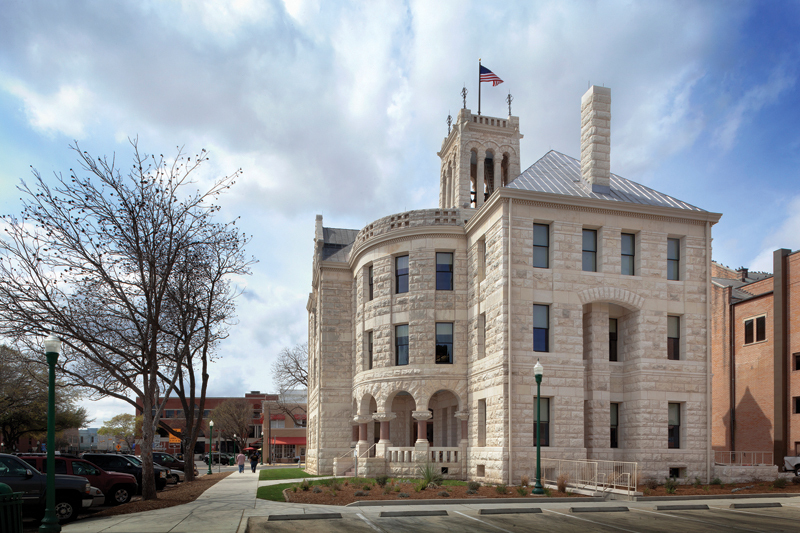 The Comal County Courthouse, designed by J. Riley Gordon in 1898, renders the then-popular Romanesque Revival in native Texas limestone. Photo by Brian Mihealsick. 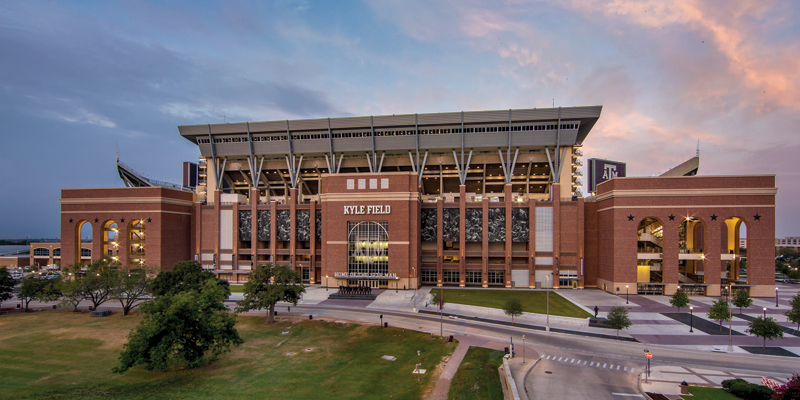 Kyle Field’s new facade evokes Roman architecture for ritual, spectacle, and competition. Photo by Christy Radecic. Austerity and iconic elements meet in a concept sketch for All Saints Presbyterian, by Andersson-Wise Architects. The pastor hopes that “our structural beauty and our liturgical beauty would come together to create beautiful lives.” Image by Andersson-Wise Architects. 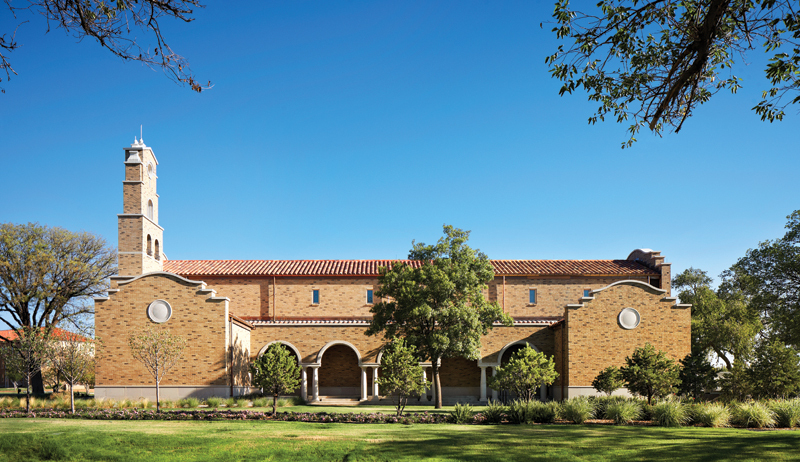 McKinney York carefully abstracted elements of Spanish Colonial architecture for the Hance Chapel at Texas Tech. The colonnade and tower share in the simplicity of frontier missions. Photo by Dror Baldinger, AIA. 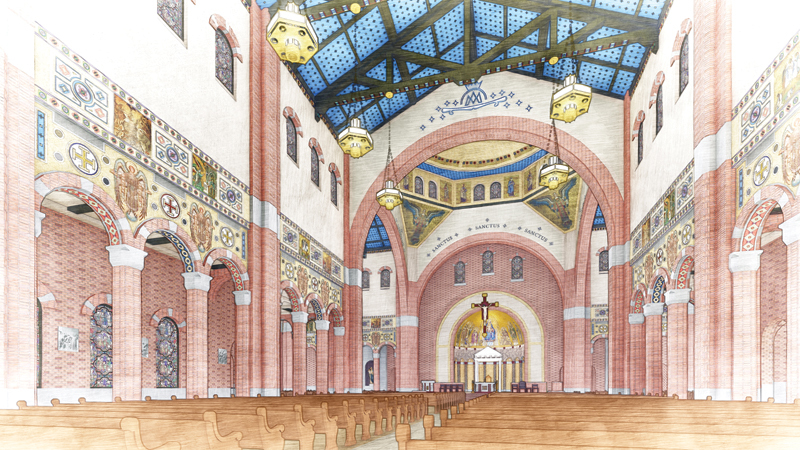 Jackson Galloway’s early concept of the new church for St. Mary’s Catholic Center in College Station is an architectural expression of the ideals enumerated in the church’s capital campaign slogan: “Beauty, Encounter, Tradition.” Image by Jackson Galloway. The past half-century has seen sacred architecture stuck in the rut of a reductive dichotomy that pits Modernism against Traditionalism. Self-avowed Modernists saw the rejection of historical forms as a point of pride and a sign of progress. The current dominant generation of architects still cringes at the thought of being pigeonholed as traditional. But a nascent resurgence of design proposals with more nuanced attitudes to architectures of the past suggests that it may well be time for a new discourse on the role of tradition in architecture, both sacred and secular. For the emerging generations of architects, canonical Modernism grows distant enough to be seen as but one among many historical moments and ultimately a distinct tradition in itself. Appeal to tradition is now paradoxically a means of challenging the status quo. We need to reconsider our assumptions of what is forward-looking and what is backward-looking, and instead critically distinguish between what is substantively traditional and what is merely conventional. What in design carries meaning, and what is an outward status symbol of ideological tribes? As so many of the particular bugbears and shibboleths of previous generations lose their potency, and as the now dubious Modern/Traditional dichotomy continues to lose its status as the first dialectic in the taxonomy of buildings, we have the opportunity to re-engage aspects of traditions in architecture that might have been too hastily rejected. Disillusionment with Modernism’s shortcomings began with the members of the Congrès Internationaux d’Architecture Moderne. As early as the 1950s, Aldo van Eyck proposed recovering discarded basic human values by examining the overlapping circles of multiple traditions. Subsequent developments have slowly whittled away at the initial scorched-earth tabula rasa ideology. With critical distance, young architects for whom “Complexity and Contradiction” and “Mathematics of the Ideal Villa” are standard texts realize the congruence of the underlying principles in what were supposed to be irreconcilable: The Modern/Traditional dichotomy seems to have more to do with method and language than with content. This new inclusive approach to tradition in architecture is analogous to the growing acceptance of descriptive linguistics. The previously dominant prescriptive linguistics attempted to determine the “correctness” of language according to pre-established rules. In contrast, the concern of descriptive linguistics is how language is used. This is not to say that anything goes: Language is communication and requires a community of speakers. Dialects overlap. Homogeneity is not a prerequisite to achieving meaningful dialogue. We can consider Western classical architecture a language family with a rich assortment of dialects: It requires competence to understand, fluency to use, and artistry to use poetically. Neglect has brought it close to death, but we still have the great works to study and an increasing number of willing readers. Kate Wagner’s erudite blog, “McMansion Hell,” is a highly popular example of the appreciation of good — and the ironic denigration of bad — traditional architecture. Its witty language may herald a new pidgin, one that combines lolspeak and memes with precise architectural terminology (and always makes the proper distinction between muntins and mullions). Perhaps much of the new openness to tradition can be attributed to a desire for authenticity, despite the fact that such an urge is easily mocked ironically. Authenticity does not require a formal language; the timeless, essential aspects of buildings become clear. The challenge is to ensure that buildings embody meaning rather than a vague sense of meaningfulness. Specificity is a potential antidote: Superficiality is a well-known, critical failure in Classical architecture. This specificity need not be a strict adherence to a universal ideal and can take many forms. Duncan Stroik at the University of Notre Dame is among the most precisely articulate practitioners of Classical architecture today. He has inspired much of the rise in explicitly traditional church designs — in particular, Roman Catholic Church designs — in large part by demonstrating that it is possible to build successfully in a faithful manner at a variety of scales. His work in Texas ranges from a small chapel for a community of Carmelite hermits in Christoval to the master plans of massive suburban parishes and a seminary. Stroik finds that his clients’ primary concerns are for “churches that are set apart, sacred, and full of imagery.” He says: “They see their buildings as sermons in brick and stone, in the sense that the churches can speak to people of eternal realities. They want buildings that are symbolic but also buildings that will last.” His studied historical authenticity provides a transcendence (temporal and eternal) that clients often found lacking in their past experiences. Stroik’s work is emblematic of the desire to recover the rich heritage of the Roman Catholic liturgy. Specificity to liturgy, which often entails specificity to regional culture, is critical. 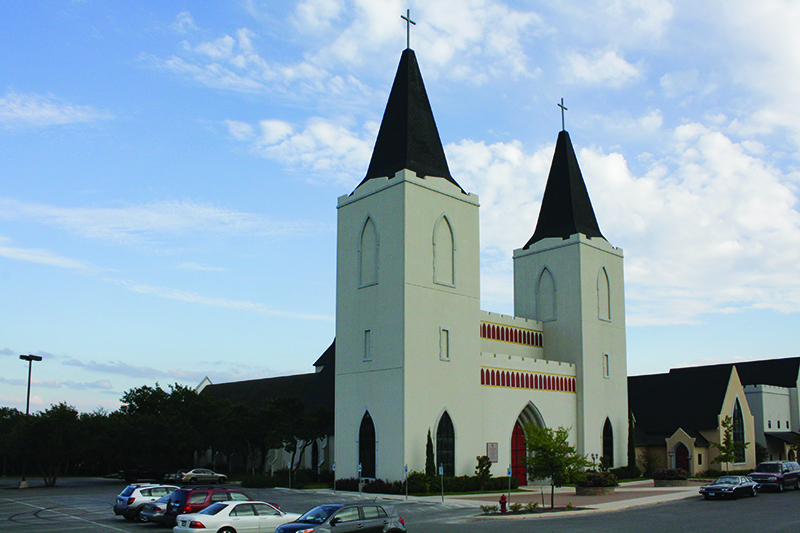 Our Lady of Walsingham, in Houston, designed by HDB/Cram and Ferguson and completed in 2003, is a preeminently successful example of specificity to a particular form of worship. It is the principal church of the Personal Ordinariate of the Chair of St. Peter, which incorporates distinctive Anglican heritage within the Roman Catholic Church. It is the proportion that distinguishes the design. It has the same broad tower and stark interior volume favored by the high-church revival architects in England and that Giles Gilbert Scott carried through to an industrial British Modern architecture. The building is unquestionably English: an amalgamation of an Anglo-Saxon tiered tower with later Norman features common to churches near the medieval shrine at Walsingham. While its models grew into the combination, the new church synthesizes them into a single expression. While this may be incorrect from a prescriptivist perspective, the language manages to be neither a direct historical reconstruction nor a capricious theme park knockoff. Compare this to another Anglican-Use Church, Our Lady of the Atonement in San Antonio, which lacks this specificity. It is Gothic in only the broadest stereotypical sense, with no correlation between tectonics and ornament. It knows a few words, but has no recognizable grammar. Cultural motivations driving the renaissance of traditional buildings represent a confluence of cultural threads; our clients deserve to be imagined complexly. While it might be easy to dismiss a resurgence of interest in traditional architecture as merely the toxic nostalgia of the country club set, the impulses are increasingly nuanced. The desire for the appearance of culture as a status symbol is most consistently evident in residential architecture, where it suffers from the superficiality of peel-and-stick embellishments and a flood of listing features without the underlying hierarchy, order, or proportion of literate classicism. McMansions perpetuate the separation of ornament from structure that facilitated the excision of ornament. But shall we continue to allow such incompetence to rob us of the rich heritage of our craft? Modernism limits some of architecture’s ability to embody the metaphor and narrative that are key to arriving at the intentional placed-ness and relationships now so highly valued in the built environment. We see these desires play out in the expansion of less-purely-rational urban planning; organic models appear in biomimicry, but previous systems and even particular forms, which are often closely related, provide additional models modified to suit human inhabitation. Abandoned historic churches have become desirable as converted lofts. The appeal of large projects like the Pearl Brewery in San Antonio extends well beyond the sustainability of adaptive reuse; the existing fabric and patina are the heart of their character. A significant rationale for the resurgent interest in traditional architecture is its ability to embody a communal character and a shared narrative. Texas has a treasured tradition of county courthouses and an accompanying town form. Many of these historic structures are explicitly Classical, but the later Art Deco and even Brutalist buildings retain aspects of an ordered hierarchy that seems fitting for edifices of their stature. Beyond formality, these buildings speak of community in a way that is made difficult by Modernism’s individualistic manifestos with their narrow-minded efforts to recreate the world in one’s own image. The collegiate stadium is one building type that has unquestionably seen a revival of traditional architecture in Texas. From Rice University’s Reckling Park baseball stadium to recent expansions of UT Austin’s Darrel K Royal–Texas Memorial Stadium, the pattern of vaguely Classical brick facades that reveal the bare structure of the bleachers from behind has become standard for sports in Texas. The most dramatic transformation is Texas A&M’s Kyle Field. What was the most uninspiringly utilitarian Brutalism now has a facade made up of discarded Roman parts. Even Baylor’s new McLane Stadium exhibits a strong processional and ceremonial quality. However superficial in tectonic execution, the motivation is clearly an appeal to “tradition/Tradition,” in a meta-metaphor where tradition is both the signifier and the signified. Beyond the celebration of a team’s history and fan customs, sporting events remain the dominant ritualized behavior in Texas: a hyper-important communal experience within a defined environment and with a shared set of rules that are assigned significance well beyond their actual action. The idea that ritual is a fundamental aspect of humanity seems to be regaining traction. The “nones” are rediscovering aspects of spiritual practice that do not involve canonical religious structures, and are discussing them as intentionality or mindfulness. (As with architectural influences, these seem somewhat more palatable if borrowed from “exotic” cultures.) Meanwhile, many are rediscovering their own religious heritages. Greater numbers of young adults seek out more “conservative” forms of worship, and many “low” Protestant churches incorporate aspects of “high” church worship. These trends do not always show up where we might expect, and they reflect a generation for whom the taboos of partisan divisions are shifting in some places. The Barna Group’s 2014 study of millennials’ attitudes toward church environments reveal these changes. They report a strong preference for “straightforward, overtly Christian imagery” and “a rich context of church history.” At the same time, 60 percent of respondents prefer a church building to be “Modern” over “Traditional,” and 67 percent say they preferred a church to be “Classic” over “Trendy.” The apparent dissonance between Modern and Classical, or a “context of church history,” is only a paradox under assumptions that do not hold for this generation. Satisfying the desires of such a group requires multiple types of buildings that do not fall into the previously stereotypical conventions of Modernism and Traditionalism. At the same time, 77 percent of millennials state a preference for “Sanctuary” over “Auditorium” and “Quiet” over “Loud”; this represents a shift away from the higher-energy performance models of worship that have dominated many Gen-X churches. Here is a desire for timelessness that architecture grounded in tradition is well suited to answer. For Rev. Frickenschmidt, thinking about the built environment is part of the larger project of consciously forming the congregation’s worship through a “return to sources.” Seeing the world sacramentally leads to a focus on the arrangement and interrelation of places, objects, and bodies as signs. Visitors to the interim sanctuary have been surprised by the intentionality and thoughtfulness of the integration of beautiful structure with beautiful structure. 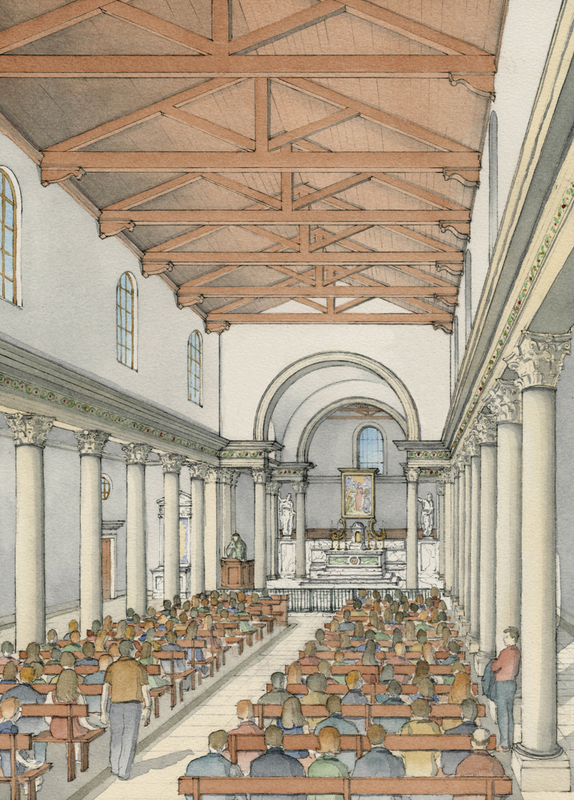 This sacramental worldview will find greater realization with the permanent sanctuary: The intent is to construct the church from true load-bearing local stone blocks that will rise out of the cloister walks, uniting the campus to form the sanctuary with an austere elegance that is timeless and authentic. The designs for All Saints Presbyterian also demonstrate specificity to the local natural and cultural context. Texas architects have well explored the indigenous building forms of the state and incorporated them into an inflected late Modernism. But there are also dialects of the Western Classical traditions that are emblematic of Texas, most notably the Spanish colonial missions and the Painted Churches created by European immigrants. By necessity, these imported models were tempered by their locale — by the landscape and by local building materials and techniques — until they became distinct. McKinney York is not a firm that would self-identify as a group of traditional architects, and yet they designed one of the most articulate and contextual buildings with direct references to built history in recent memory: the Kent R. Hance Chapel at Texas Tech University. In stark contrast to Duncan Stroik’s work, Traditionalism is not the goal for McKinney York. That Hance Chapel engages with Classical architecture and with the particular lineage of Texas mission architecture is an artifact of McKinney York understanding the context and the program. It is the unprejudiced conclusion of a holistic Modernist process and a prime example of non-reductive abstraction. Texas religious architecture does suffer from some frivolous eclecticism, but one of the more compelling local dialects in Central and East Texas is an interpretation of the Byzantine-Romanesque. Examples of this expression range from the exquisite Beaux Arts Central Christian Church in Austin, to the German Benedictine St. Peter in Lindsay, to the elegant simplicity of St. Anthony in Bryan. Secular buildings such as UT’s Gregory Gym and many county courthouses throughout Texas share this heritage. The Romanesque provides fertile ground for a middle way. The strong lines and volumetric massing lend themselves well to manipulation, allowing adaptation for changing programs while maintaining a regulating hierarchy and order which do not need to be rigidly static. The plasticity of its forms has resonance with some of the more sculptural 20th-century brick expressionism, from Dominikus Böhm to Edward Dart, FAIA. 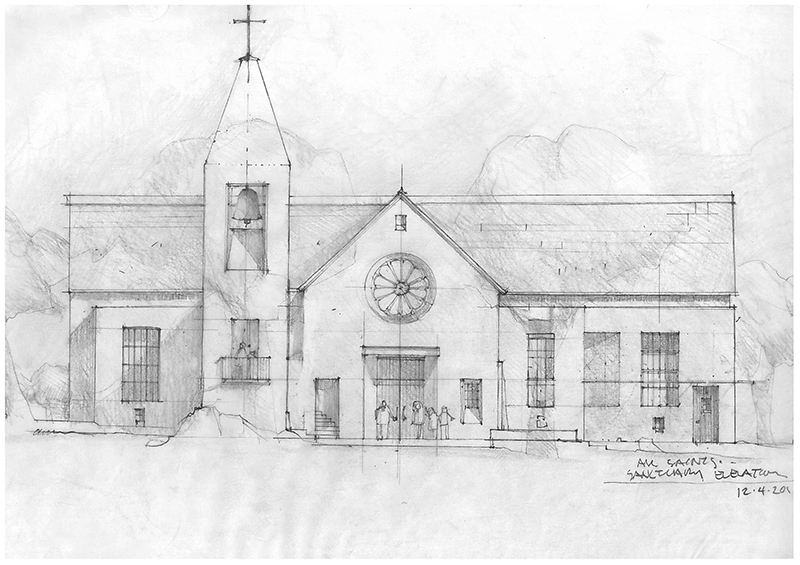 It should not be surprising that Jackson Galloway Architects’ early conceptual design for the new church at St. Mary’s Catholic Center in College Station participates in this continuity to engage the local heritage, honor the liturgical and denominational identity, and respond to the motivating desires of the generation it serves. During the design process, students consistently voiced a desire for the church to be authentic, durable, noble, and recognizably Roman Catholic. They sought a building with formal beauty, but one that was also warm, welcoming, and engaging — one that provided a powerful encounter with Christ. These are complex motivations that echo the apparent paradox seen in the Barna Group survey. St. Anthony in Bryan and St. Mary in Brenham provided local models, and there is an echo of Central Christian and the Battle Hall library in the wooden heavy timber trusses. The interior arrangement reflects current movements in liturgy toward more nuanced and holistic understandings of their worship. It also participates in the development of the historic Northgate neighborhood toward urban density in an accelerated version of the traditional place of church buildings in forming town centers. According to Michael Raia, Assoc. 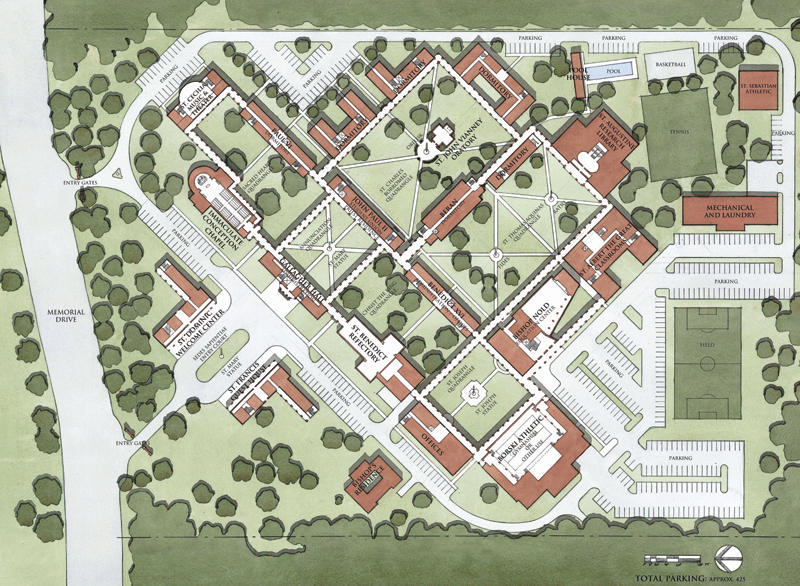 AIA, who is leading the design of the new church for Catholic Aggies, the design is an attempt to balance the tensions present in concretizing the transcendent by consciously submitting to a living tradition. For Raia, the keys to achieving a living tradition are the distinction between “doing” and merely “referencing,” and between understanding what is essential and knowing when to deviate in response to tectonic and cultural criteria. It also helps that this work is part of a diverse practice where a response to the client’s identity and motivations are the genesis, not identification with a restrictive style. Tradition in architecture no longer needs to be a dirty word. A new, descriptive approach to resurgent living traditions will further the trends of openness to historical forms and actions, resurgent ecumenism, and the leaving behind of the baggage of outdated polemics. At the same time, we see evidence of contrary trends toward increasingly isolated partisan tribes with pillarized sects, medias, and, possibly, architectures. These prefer isolated models of absolute ideals that signal distinctions between in and out, us and them. However, with the requisite sophistication to appreciate the specificity of contexts and multiple dialects, tradition need not lead to a universal model or prescriptivist exclusivity. Engaging the tensions in tradition and imagining complexly our clients’ motivations will lead to more nuanced sacred buildings and their mutual enrichment. Jason John Paul Haskins, Assoc. AIA, is a church-building researcher and design consultant who writes about liturgy, architecture, and history at locusiste.org.